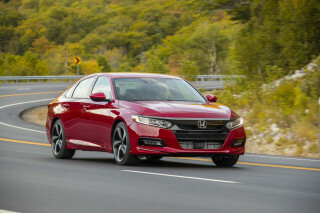 There’s a whole generation of drivers who’ve grown up equating names like Camry and Accord with the mid-size sedan, and indeed, for most of the last decade, the imports have dominated what was long the largest segment of the American automotive market. 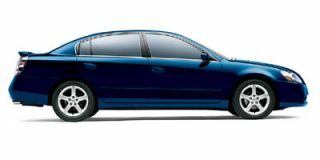 It’s easy to forget that Detroit once ruled this roost with products like the Chevrolet Impala, Oldsmobile Cutlass and, in the waning days of Detroit passenger cars, the Ford Taurus. When it emerged in 1986, the stylish and sophisticated sedan set a new benchmark even Honda and Toyota struggled to meet. Ford’s mid-size marvel spent years at the top of the U.S. sales charts. Today, though, Taurus has tumbled so far down the hill it’s an almost forgotten entity. Only fleet sales keep it alive. Ford has done little to polish the sedan up, and it’s likely to vanish with barely a whimper over the next few years. In a sign of the times, Ford won’t replace the Taurus, at least not with another car by that name, nor even with a single new mid-size sedan. The market is fragmenting. Consumers want vehicles that reflect their precise needs and desires. So the gap laid open will be filled with three separate products. There’s the new Freestyle crossover, a slightly smaller-than-Taurus four-door due out as an ’06 called the Futura, and this year’s Five Hundred sedan. “It’s a very different way of us going to the market,” says Ben Poore, marketing director for Ford cars. 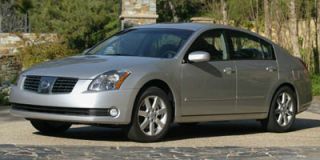 Those who recall the concept car from which it borrows its name will find the 2005 Ford Five Hundred to be a very different vehicle. It’s a much more sedately styled sedan than the flashy show vehicle. That reflects the conservative nature of the typical mid-size buyer, insists Ford Design Director J Mays. 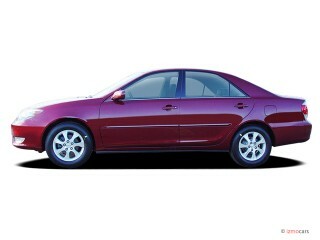 The bland Camry could be considered proof of that. Whether that’s a successful strategy for a struggling company like Ford is another matter. But the U.S. maker is betting buyers will be won over by Five Hundred’s other attributes. “Guilt-free luxury,” is the way Mays likes to put it. 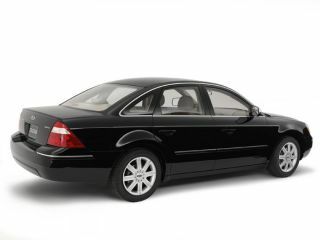 The sedan’s exterior dimensions are just a bit larger than the Taurus. 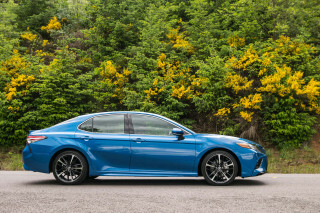 But the two sedans are in a separate league when it comes to usable passenger and cargo space. The passenger compartment alone measures 128 cubic feet and though the new sedan is a foot shorter than the big Crown Victoria, the Five Hundred boasts twice the rear knee room — more, in fact, than a Rolls-Royce Phantom. To put that into human terms, a pro basketball player could sit in the back without having to do an impression of a human pretzel. The trunk, meanwhile, is large enough to hold eight Tiger Woods–sized golf bags. Credit Ford for rethinking the way its passenger cars are laid out, setting out a new design and engineering philosophy you’ll see spread across its lineup. Start with the fact that you sit at least four inches higher in the new Ford than in conventional mid-size sedans. Perhaps a bit of hyperbole, for Chrysler is using a similar strategy for new products like the 300C sedan, but the point is well taken: Ford may have declared this “the year of the car,” but it is a different car from the ones the company built before. 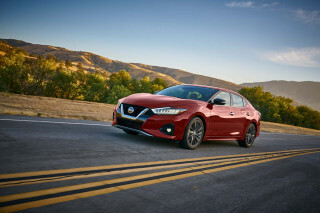 And vehicles like the Five Hundred have a lot in common with today’s popular SUVs — the products that have won over millions of once-loyal sedan buyers. 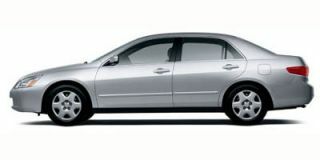 The Five Hundred even offers an optional all-wheel-drive system. This electro-hydraulic Haldex system was heavily influenced by Ford’s Swedish affiliate, Volvo. Buyers will have a choice of AWD or front-wheel-drive. All models will feature the 3.0-liter Duratec V-6 which, in most applications, will be mated to a new continuously variable transmission. Once a technical oddity, the CVT is quickly becoming a popular choice, offered on everything from the Saturn VUE to Audi’s A6. We’ll sidestep the heavy technical issues and let it suffice that the CVT eliminates the step gears found in conventional transmissions. When properly engineered, that can improve ride comfort and boost mileage five percent or more. A recent prototype tested by TheCarConnection was one of the best uses of CVT technology to date. 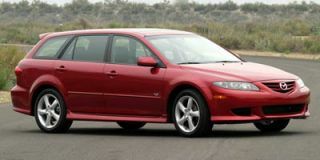 A six-speed automatic will also be offered for some FWD versions of the Five Hundred. If bigger is better, more is a must. There are eight cupholders in this car, and countless little nooks and crannies for storage. Design Chief Mays is a big proponent of interior design. “That’s where you spend your time with the car,” he stresses. And his team has taken him at his word. There are some significant improvements in the sort of materials Ford is using — like a new hydrographic system for applying wood appliqués — while the fit and finish is markedly upgraded, as well. In some cases, Ford is simply catching up with much-needed improvements, like trunk hinges that fold away, rather than plunging into the cargo cavity, where they’ll crush any luggage in the way. The automaker has added a number of safety features compared to the aging Taurus. There are new, energy absorbing bumper beams and front crossmembers to help in side impacts. Stability control is standard with AWD, optional on FWD models. Some features are optional, side airbags and side canopy airbags, to name two of the most important. With similar systems being made standard by import competitors — notably Honda — Ford may need to revise its strategy. 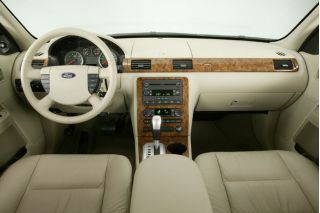 Ford doesn’t have the same, high-volume aspirations for the Five Hundred that it did with the original Taurus. 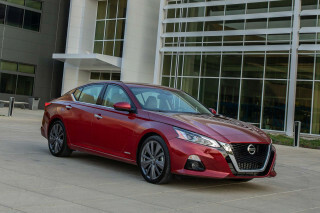 It’s not saying precisely how many of the new sedans it expects to sell, but it’ll be significantly less than the 400,000-plus numbers rung up during the old car’s heyday. In fact, the Chicago plant producing the Five Hundred and Freestyle will have capacity to build barely 300,000 of all those new models combined. And that doesn’t even include the Mercury versions of those products. That roll-out begins with the new Montego, the smaller division’s version of the Five Hundred. It’s one of several critical new products aiming to keep Mercury alive after years of neglect. 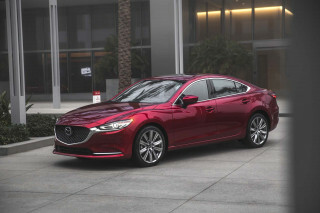 The Montego is the division’s first all-new sedan in 25 years, notes General Marketing Manager John Fitzpatrick, and critical “to stop people from migrating away” to other brands with newer products. Will people notice the Montego? That’s a question many analysts are asking, and for good reason. Park the Montego and Five Hundred side-by-side, and you’ll have to take a second glance to be sure which is which. 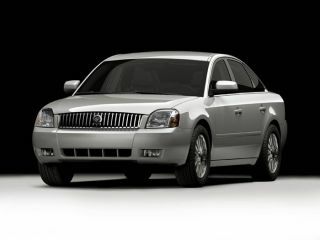 The Montego gets Mercury’s waterfall, satin-aluminum grille, a monochromatic exterior, high-intensity discharge headlamps, and LED taillamps, but the basic shapes are otherwise identical. Mercury marketers expect the AWD option to be even more popular with Montego buyers than those opting for the Ford Five Hundred. It should account for “about a third” of Montego sales, forecast manager Phil Kurrle. It may be the year of the car, but Ford doesn’t really see the mid-size sedan regaining the dominance it held in the past. The Five Hundred and Montego are important pieces in the automaker’s revised lineup, but trucks like the Ford Explorer and Mercury Mountaineer will remain the truly big sellers for families on the go. I have four whell drive at 100,000 km it broke down cost me $2,000.00.every month or so something break down.Nice car to drive but? By far the cheapest car to own and operate over many years. I bought this car with 400 miles on it and now it has over 165k. 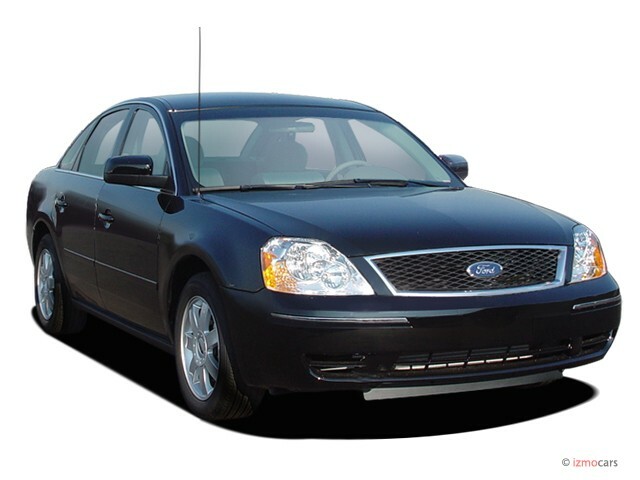 Tires, oil and gas have been my only expenses with the Ford Five Hundred.